First time homeowners and established residential customers often run into an issue when discussing their exterior walls with a contractor or repair company—what materials should I consider? All these materials have their advantages and disadvantages. So, if you are on the market for a new exterior wall, or if you are looking to make the right choice for a new home you are building, read some of these comparisons to see what the right fit might be for you. To compare these materials and help you make an educated decision, we decided to focus on a few simple yet important criteria. 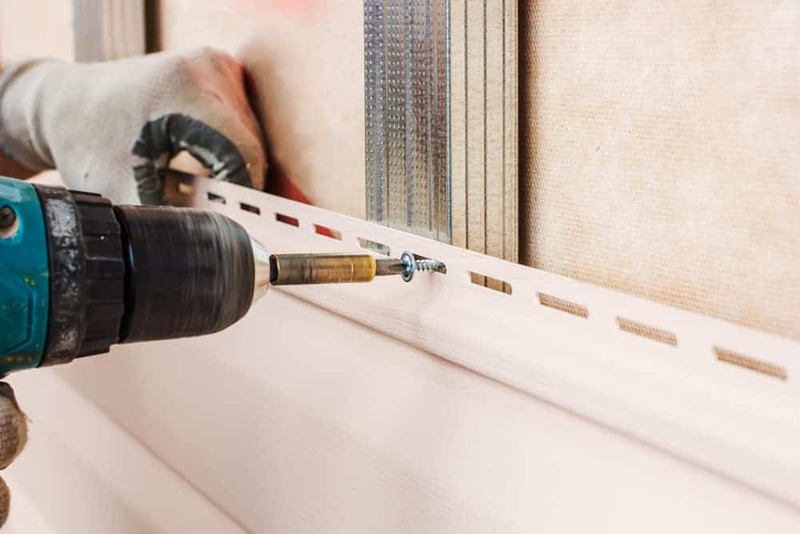 Cost – managing costs for short and long-term investment might be the most important aspect of the decision-making process when it comes to your walls. We’ll talk about the upfront costs of each material and the long-term maintenance costs as well. Maintenance – did we mention maintenance costs? Here we’ll break down what maintenance looks like for each material. Efficiency – energy efficiency is a core concern for many homeowners, and because of that we will also remark on how each material works with conserving heating and cooling throughout extreme winter and summer months. Longevity – likewise, we’ll discuss how long each material can be expected to last, with what kind of care, and when you need to think about replacing it. Value – How does each material contribute to the value of your home. First, let’s be straight – brick is going to cost the most, bar none. That’s because brick can cost upwards of $15 per square foot, depending on the brick. Wood, depending on the style and material, can come close to this (as a cost of up to $12 per square foot), and because of that there can be some give-and-take between brick and wood prices. In the short term, upfront costs are going to be lowest with vinyl siding and highest with brick or wood. Vinyl siding prices are typically the lowest, even if you purchase energy-efficient and colored siding materials. Long-term costs are going to depend on your location and the weather there. Vinyl will need to be replaced more often, while brick will stand the test of time longer with less over all work. Brick, by far, is the easiest to maintain, so long as you don’t have serious issues with it. Well, it is entirely possible that heavy impact or damage can hurt brick. It’s also likely that, depending on the construction of your house, your foundation could settle and cause stress fractures or cracks in the wall along mortar lines. Either situation requires you to replace a section of it. And when you must replace a section of brick, you’re facing a much more difficult task – cutting out a section of the brick, reinserting new brick, and ensuring that your mortar and brick colors match the existing material. Even if you find the same brick, the aging process means that repaired spots in your brickwork are readily noticeable (at least initially). Wood looks beautiful but will begin to crack and split in the heat and rain. More importantly, however, is that wood is porous, and can and will cause your house to grow mildew and mold over time. You can clean wood yourself, but you’d probably be better off hiring professionals to seal your wood on a regular schedule (which could cost upwards of $1,000-$2,000 or more, depending on the size of your house). Vinyl is easy to clean, resists mold, and is easy to replace if it is damaged. It is much easier to damage, however, and can warp or deform in extreme weather conditions. So less hands-on care is your tradeoff for a material that might require repair or replacement more often. Energy efficiency is going to make a big different in your home’s heating and cooling bills. Since brick, exterior wood siding, and vinyl siding are such radically different materials (and since wood siding can also come in a huge variety of forms), it’s hard to say specifically how efficient each one will be. As a rule of thumb, brick is going to provide the most bang for your buck. Full-size brick, installed properly, will keep heat out of your home and keep climate-controlled air in. Wood panels and vinyl siding, typically being thinner, will not resist weather or extreme temperatures as well as brick. Wood siding, however, can often be more energy-efficient than vinyl depending on the type of wood used and the thickness of the materials. While it is difficult to maintain should the worst occur, brick is sturdy and strong. You’ll find yourself having to clean or replace any brick much less than with wood or vinyl. Also, brick is a classic look that doesn’t completely fade or wash out over time, which means that even aged brick can be attractive. Your main issues are going to stem from the foundation settling or impact damage. Wood paneling, properly treated, can also last for decades, especially if you treat it properly. However, you will need to inspect wood paneling for rot or mildew on a regular basis, and take the time to treat it, clean it, and ensure its health. Vinyl doesn’t have the same longevity as either wood or brick, but it makes up for that in its ease of care. Just be prepared to have sections replaced if they start to warp. When it comes to adding value to your home, nothing beats brick or wood. Brick is classic. It’s strong, solid, and comes in several colors. Brick mixes well with other wall materials like vinyl, wood, or stone paneling. And if your bricklayer knows what he or she is doing, you can get mortar coloring that matches your bricks for a unique look. Wood is incredibly flexible. Not only does it come in a variety of colors and types, but you can get it in a few attractive styles. Wood siding panels, shingles, or traditional siding can complement the look of any home, and with a selection of colors can provide a modern or classic look to your home. Both wood and brick can increase the value of a home simply for their cost and attractiveness. Vinyl siding, however, is catching up. New siding materials are making vinyl a tough competitor for other materials, and contractors and hardware stores typically offer a slew of vinyl siding colors not available for brick or wood walls. If you’re thinking about adding to the value of your home, or making sure that it retains value over time, go brick, followed by wood. But vinyl is an attractive option that can give you the house that you want without totally breaking your budget. For increased property value, go with brick or wood. For budget-friendly and low-maintenance exterior walls, go with vinyl siding. For energy-efficiency, brick is the best, but thicker wood or Energy Star-rated vinyl can do. There are great options for all these materials, so talk with your contractor about what’s best for your home, your area, and your budget. Rennison Roofing and Exteriors specializes in roofing needs for homes and businesses. Our professionals are also licensed and insured to replace windows, doors and siding on homes. Located in Irmo, South Carolina, we are the Midlands best choice for high quality exteriors repairs.